In 2006 we had about 70 kayaks. In 2007, more like 170. In 2011 we were blown off the water with gale force winds. This year the weather will be perfect … hopefully! Kayak Rental's and Gear will be at the launch site at 7:15 (must reserve a rental kayak or canoe before the event). This year we will not be having conch chowder or the BBQ after the event. This year's event is scheduled for Saturday, January 24th and we are looking forward to another great day. The event will be the same informal format as in the past ... very casual. It is a social event to bring together paddling folks for a day of family-oriented fun. 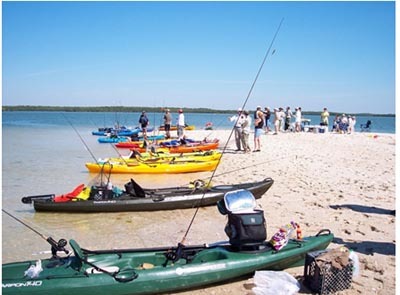 It is a great opportunity to meet new friends who enjoy the paddling the area, learn a bit of the colorful local history and experience a wonderful part of Florida. We will not be having conch chowder or the BBQ this year so please pack your lunch. 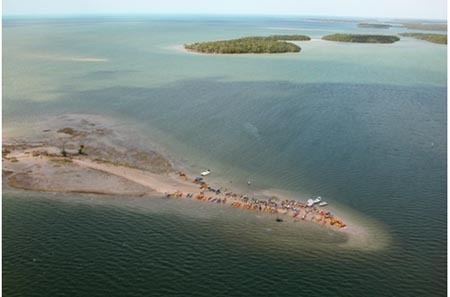 Like last year, we will be paddling with the assistance of the tidal current to a beach site on "Indian Key" in Indian Key Pass. The low tide at Indian Key is about 11am. The tidal flow will not be a very strong tide. This means current flow stops and reverses direction on the island about 12:30. Unlike most other years, we do not have to leave at daybreak! We are planning an 0730 launch. You are certainly welcome to leave earlier or later, but please be aware of others, particularly the Park staff, and do not clog up the launch site with vehicles. Please park where designated and ready your craft and gear before coming to the launch. There will be a shuttle trailer to take you to the launch. Rental Kayaks will be available, but you do need to reserve them in advance.